By Rowena Mason and Philip Oltermann | German chancellor says it is right for all parties for Britain to ‘identify its interests’ before invoking article 50. The German chancellor, Angela Merkel, has backed Theresa May’s decision to wait until next year before starting the formal process of leaving the EU, despite pressure from others in Europe for a speedier exit. After their first meeting in Berlin, Merkel gave support to the new prime minister, saying it was right and necessary for Britain to “take a moment” to work out what it wants. She also did not rule out a deal for the UK that combines free trade with controls on immigration, saying Germany would be listening to what Britain wants before coming to a decision on its position. “We are listening to the UK, we are listening to Britain what it actually wants and then we will give the right response,” she said. In the days after the vote for Brexit, France was one of the countries urging the UK to start the process of leaving the EU as soon as possible, with its foreign minister saying it was a matter of respect not to “play cat and mouse”. But after an hour of talks in the German chancellery, Merkel said it was “absolutely understandable” that May’s new government will have to “take a moment first and try to seek to identify its interests”. “It is after all to our advantage to have the UK define its negotiating stance in great detail and clarity and if possible also to clearly outline how it sees its future relationship with Europe,” she said. 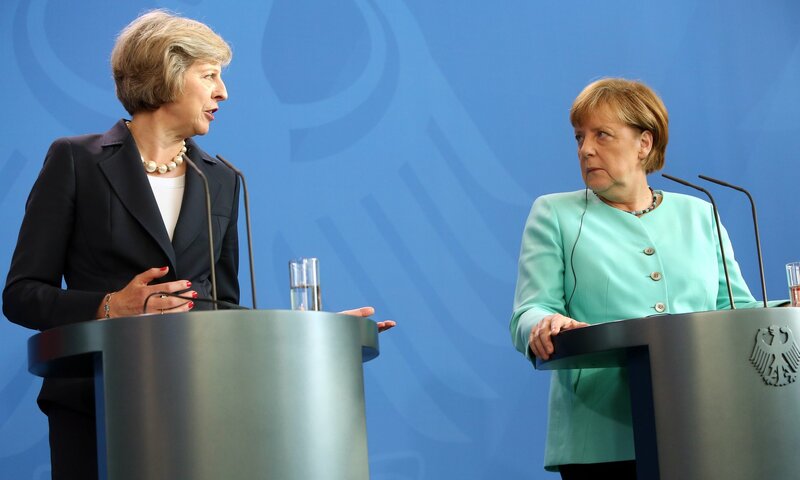 Standing alongside Merkel, May made it clear that she was not going to bow to calls to immediately trigger article 50 of the Lisbon treaty, which starts the formal exit process taking up to two years. May and Merkel give a joint press conference in Berlin. “I want to work with chancellor Merkel and my colleagues around the European council in a constructive spirit to make this a sensible and orderly departure,” she said. “All of us will need time to prepare for these negotiations and the United Kingdom will not invoke article 50 until our objectives are clear. Despite offering her support on the timeframe of article 50, Merkel stressed she was sticking to the EU rules that ban formal negotiations with Britain until the clause of the treaty is invoked. She would not be drawn on how Germany sees its future trading and labour relations with the UK. “A good negotiating process and a sensible and constructive one is in all of our interests. So we will wait for the moment when the UK invokes this – and then we will put our guidelines on the table,” Merkel said. The prime minister was also grilled by German media about her decision to appoint Boris Johnson as foreign secretary despite his undiplomatic comments about some other countries. The prime minister defended the decision, saying she had chosen a strong team. The two leaders then had a working dinner and later the prime minister presented the chancellor with a small gift to mark her birthday last Sunday. Reflecting their shared interest of hiking, she chose two books – Coast to Coast with Wainwright, a photographic book from 1973, and Great Mountain Days in Snowdonia – with a handwritten message of best wishes. May is understood to be returning to London before a meeting in Paris on Thursday with François Hollande, the French president. France’s attitude towards May and her strategy on taking the UK out of the EU is expected to be somewhat less accommodating than that of Germany. Posted by Above Whispers on July 20, 2016.